Soulsville Charter School senior Veronica Parker first made headlines on local television in her 2015/2016 senior year at TSCS when she and other members of the school’s debate team helped Rep. Raumesh Akbari draft a bill focusing on helping people expunge low level crimes from their records in order to get a second chance at a brighter future, and presented it to a subcommittee in Nashville. She went on to the national debate finals in San Francisco and debated against the best students in the country. In 2015, however, Veronica traveled much further and spent time living and studying in Idaho and Chile via a partnership TSCS formed with the Alzar School. She was just one of the students who made the trip leaving Memphis to live on another continent definitely had a lasting effect on Veronica. How many years did you attend The Soulsville Charter School?(TSCS)? I attended Soulsville almost four years. I came to Soulsville the second semester of my freshman year. 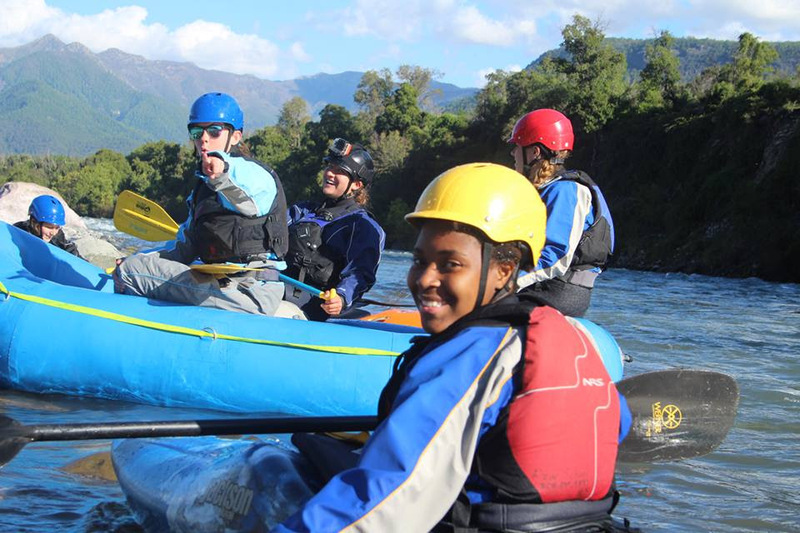 How did you find out about the Alzar School program in Chile and what made you want to go? One of the Alzar School’s founders, Kristin Bierle, came to Soulsville to find students to attend the school. I wanted to go to Alzar because I wanted to be different and couldn’t pass up the opportunity to travel the world. You went to Alzar’s school in Idaho before and after Chile. What was Idaho like? Idaho was full of nature and there were lots of beautiful things to see. Alzar is located in Cascade, Idaho with a little less than 1,000 people. The people in Cascade were all so welcoming of the students and everyone seemed to know the students from the school. Where else had you been able to travel while being a Soulsville Charter School student? Because of TSCS I was able to go to Emory University in Atlanta, Harding University in Arkansas, and to Nashville and San Francisco for debate. I am most proud of my trip to San Francisco. My debate partner and I went there for Urban Debate League National, where we competed debaters from all across the United States. We were one of the top teams in Memphis. Because of this, I am proud. Not of my accomplishment, but of the work and time I put into debate. What dates did you attend the Alzar School in Idaho and Chile? I went to Alzar in April 2016 and I returned the following December. What was a typical day like in Chile? What kinds of things did you do? A typical day in Chile depended on what we were doing that week. We completed home stays, expeditions, surf lessons, classes, and conversational challenges. Each and every week was different. What kinds of friends did you make both in the school and just in general and where were some of them from? I made a lot of friends who I will always keep in contact with. At Alzar, I stayed with those who went to school with me, so everyone was like family. The best part about living with those you go to school with is that you not only do that but you also get to experience other things. We cooked, camped, hiked, built fires, learned, kayaked, and faced challenges all together. Everyone was from different places so we got to learn a lot about each other. One day in the market, I had the pleasure of meeting two girls who are now really good friends with me. They both are from and currently live in Chile. What did you enjoy most about Chile? I enjoyed staying with a host family the most in Chile. During this time we went to school with our host sister/brother. Then we would do everything with them, but in the middle of the day we attended our normal classes. We would return home with them after they left school. My host family made it so I was apart of the family. They were extremely nice and helpful. Being at Alzar made me realize the importance of doing things outside of my comfort zone. I had a lot of firsts at Alzar like hiking, backpacking, surfing, traveling internationally, kayaking, rafting, camping, and even living in a yurt. Although I was afraid in the process of doing it, I became strong willed and strong minded. If I could do it all over again I would. What were some of the most valuable lessons you learned? The most valuable lesson I learned was time management. As a student going to Alzar, I always had something to do. I had to learn to take time out to do my work and use the time I had wisely. Did you gain more of a worldview through this experience? I realized that everyone doesn’t live the same. Even in Idaho things were very different from Memphis. My instructors were very helpful and kind. In a way everyone at Alzar was family. We did everything. No one was ever left out or forgotten. My instructors were very familiar with all of the challenges we faced, which helped us to get through each of them as they arose. How do you think your time at TSCS prepared you for an experience like this? TSCS helped me to become familiar with the outside world. With the chance to do Summer Growth Experiences I had the chance to go to college and be away from home. This helped me a lot to get adjusted to the college environment. Veronica is now a freshman at the University of Memphis.